Bits & Scraps Of My Life: Look what Michelle is giving away this month!!!!! Look what Michelle is giving away this month!!!!! 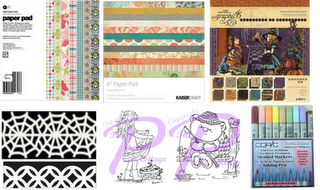 The lucky winner will get to pick any one 6x6 or 8x8 paper pad from her store. They will also get to choose one punch of their liking, and a Pixie Cottage stamp. Best yet they will also get to choose 3 Copic markers!!!! YOWZA!!!! Copics are like gold dude!!!! Head on over to her blog!! And while you are at it check out her store too!! !